There is only so much deep soul diving that any one human can do, and then we just have to come up for air. Sometime during the next lunar cycle, you are going to notice that impulse to surface. This is the nature of the jump from Scorpio (fixed water) into the next sign, Sagittarius (mutable fire). The lunar cycles have been doing a mid-course shift to the next sign’s energy lately and will continue for a few more months. So we get to explore those cusps and shifts between the signs. Astrology is a symbol language for noticing energy and impulse. Through the practice of mindful awareness and intention following a lunar cycle, it is possible to hone our perceptions of energy. This is one of the eternal delights (for me) of astrology. Astrology’s symbols are based in nature. The elements and seasons provide the wisdom. See what you notice this month as you observe the shifting energy and the messages from the world around you. 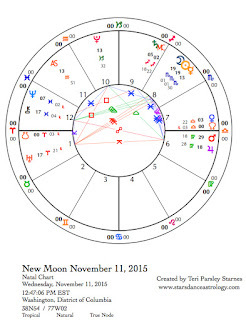 The New Moon on November 11 anchors us in the soulful sign of Scorpio. There is more to experience within. The dying season calls for retreat and rest. When left with only our own thoughts, what do we discover? Emotions that feel taboo, like grief, depression, jealousy, and fear are stirred up. This is the time to see what is in there when we go past exterior niceties. Eleven days later, the Sun enters Sagittarius as New Moon intentions wax and grow along with the Moon. The Full Moon illumination on November 25 emphasizes the Sagittarius/Gemini polarity where the microcosm reflects upon the macrocosm. What have we been learning? What do we want to do next? Small and large acts matter. By the Full Moon, Scorpio’s interior focus is complete for the time being. The imperative now is to journey outward to find expansive, uniting truths that will guide us into deep winter. This month an influential transit begins: Saturn in Sagittarius squares Neptune in Pisces. This transit represents an important turning point in the synodic cycle of Saturn in aspect to Neptune. A synodic cycle is the period of time it takes two planets to come back into the same aspect with each other. Every 35 – 36 years, Saturn and Neptune come back to this waning square aspect we are experiencing right now. In 1989, Saturn and Neptune began a new cycle when they conjoined in Capricorn. In 2006, these two planets opposed each other (Saturn in Leo, Neptune in Aquarius). The waning square, like the last quarter phase of the Moon, is about evaluating an experience. We discard what doesn’t work and hone what does. These two planets represent dreams and fantasies (Neptune) and limitations and commitments (Saturn). 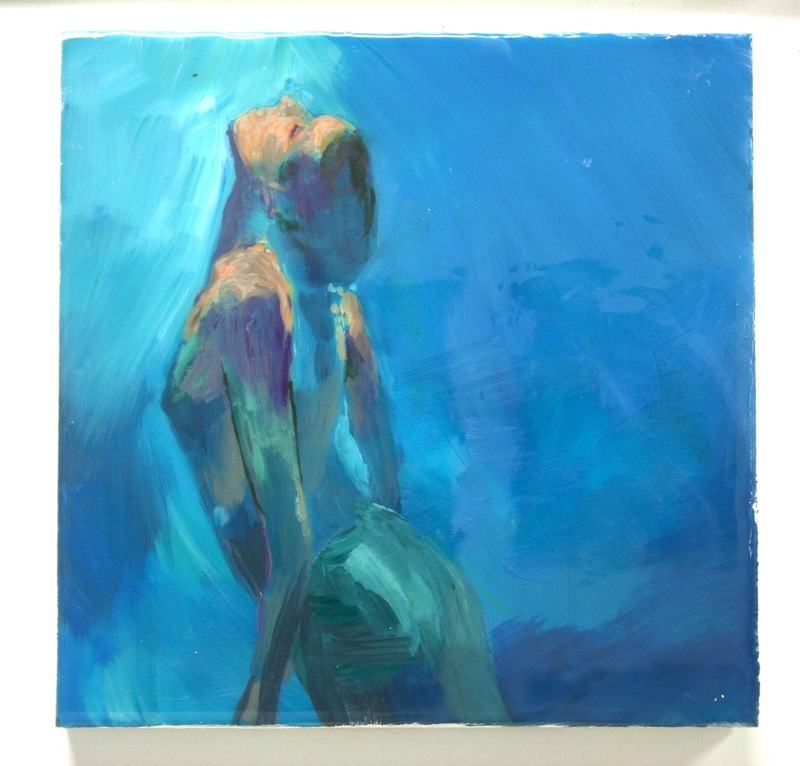 Saturn infuses a dose of realism into Neptunian hopes. With this waning square, it is time to get real and get off the fantasy train. The context, provided by the signs that Saturn and Neptune currently occupy, is the effect belief and philosophy have on our potential to wake up and start the work of manifesting our dreams. Beliefs can be both limiting and liberating. Belief can keep us separate from others or unite us. Belief can fuel wars or peace. Belief can distract or keep us focused and hopeful. Belief is a tool in Saturn’s hands. How will you use this tool? This month, we begin such explorations with the onset of these squares. The next two will be in June and September of 2016. Monday, November 9. The Moon is in Libra most of the day and void-of-course too until entering Scorpio in the late evening (CST). (Void-of-course is a period of time that can feel listless or lacking direction). Under the Libra influence, we may be weighing our choices. You might be feeling indecisive. The agitating factor that could force you to make a decision before you are ready is the quincunx aspect between the Sun in Scorpio (fixed water) and Uranus in Aries (cardinal fire). Anything simmering under the surface could suddenly erupt. Be careful as you negotiate a day where being non-committal could be the best course of action. As an anchor, tap into your heart wisdom, with the Sun’s trine to Chiron in Pisces (mutable water). Tuesday, November 10. Words are powerful at any time, but maybe even more so today. The favorable aspect between Mercury in Scorpio (fixed water) and Pluto in Capricorn (cardinal earth) gives power to our words. Make them count. We especially want to share our deeper, emotion-fueled truths. No time for vacuous communication. On top of that, we are feeling lucky too with a favorable aspect between the Sun in Scorpio and Jupiter in Virgo (mutable earth). This is a great transit under which to initiate transformation and healing. Since this is the last day of this lunar cycle, allow a moment to release and empty. Be good to yourself and begin to think about a new lunar cycle beginning tomorrow. What is stirring in your soul? 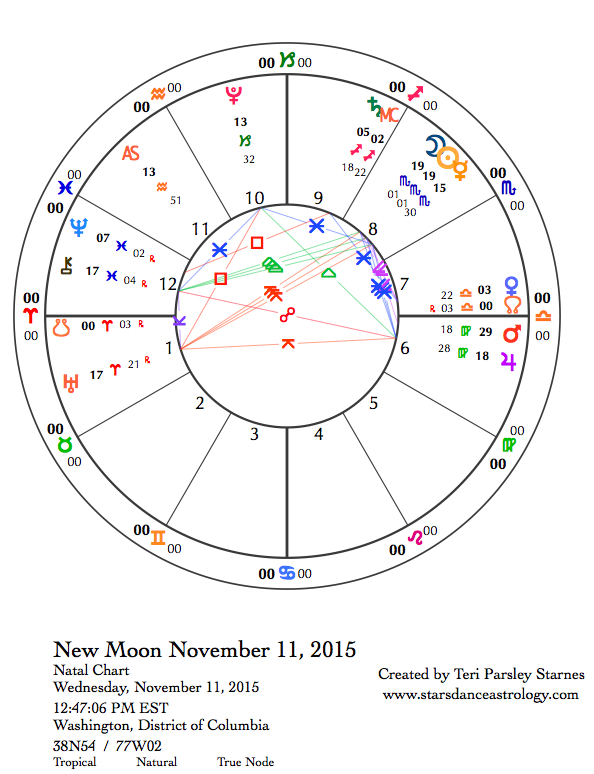 November 11—New Moon: Dreaming. The unseen world feeds the world we see around us. We are in constant exchange. The season of Samhain is marked by this awareness that we are in relationship to the unseen and that we owe this world a debt. The land of the dead, the roots beneath us, the mysterious flow of energy, all these realms come into focus when the veil between the worlds thins. Today’s New Moon in Scorpio is another moment to notice the relationships we have with all the worlds. An excellent intention to follow this lunar cycle would be to tend the relationship we have with the “other side.” Perhaps this means looking at your fears around death or your resistance to emotional experience. It could mean devoting yourself to serving some aspect of that world. How do you bring honor and respect to your ancestors? Intuition plays a big role in the energies of this New Moon. Neptune is beginning to come to a standstill in apparent motion and will begin to move direct next week. This planet is connected to unseen desires and dreams and is powerful at this time. Mars spends its last day in Virgo (mutable earth) and moves into Libra (cardinal air) tomorrow. In this sign, Mars is a pussycat. The potential represented by this energy is for a healing of the martial aspects of our culture. The warrior in this sign is interested in how others feel. This is a good start. The trick is to find balance between what we need and what others want from us. The Sun and Moon are sextile Jupiter in Virgo giving a sense of optimism to our lunar intentions. Honoring the unseen world, which feeds our own, promises wholeness and health to all the realms. May it be so. Thursday, November 12. Yesterday’s New Moon may have felt dreamy and otherworldly, but that changes today. With the Moon’s ingress into Sagittarius (mutable fire) our attention turns to the worlds of philosophy, adventure, and possibility. Mercury in Scorpio (fixed water) is busy today too, first making a trine to Chiron in Pisces (mutable water) and then a quincunx to Uranus in Aries (cardinal fire). Expect to uncover new insights. There could be breakthroughs, especially if you are willing to think outside the box. Chiron reminds us to stay connected to our hearts. There is a lot to learn by empathizing with others. Mars moves into Libra (cardinal air) today. Since Libra is opposite one of the signs that Mars rules (Aries), this planet will have to make adjustments to truly feel comfortable in this sign. We will feel that awkwardness in our relationships. But the opportunity is to blend an awareness of how others are feeling with what we want for ourselves. The opportunity is to learn to be more gentle for the next two months. Friday, November 13. With its association with witches and warnings to beware misfortune, Friday the 13th is the perfect note to strike at the end of this Scorpio season. Witches are comfortable with the things others might find fearful. But perhaps this is just a willingness to see things as they are. Try on your own witchy senses today. I recommend Terry Pratchett’s Tiffany Aching books to get a sense of how a real witch behaves. There really isn’t much to fear today. In fact, things move along swimmingly. A favorable aspect between Venus in Libra (cardinal air) and Saturn in Sagittarius (mutable fire) feeds security in our relationships. The favorable aspect between Mercury in Scorpio (fixed water) and Jupiter in Virgo (mutable earth) creates connection with others. Find your mode of expression and go for it. Saturday, November 14. Choice can be hard when you see so many sides to the issue. We might struggle with decision-making today because we see so many sides. The quincunx between Venus in Libra (cardinal air) and Neptune in Pisces (mutable water) expands what we are able to perceive. The problem is that this doesn’t necessarily bring more clarity. The obvious solution may be only an illusion. When the Moon moves into Capricorn tonight (CST) it is time to shake off the fog. November 15—Crescent Moon: Beginning. The first three days of a lunar cycle are devoted to wondering and dreaming about our intentions for the cycle. At the crescent phase we begin the journey of working towards those dreams. Inspired by Scorpio, your intention may involve a closer relationship with the unseen worlds. Doing this work creates wholeness in all the realms. What are you doing to serve the world that feeds ours? The Moon in Capricorn (cardinal earth) means business. We take responsibility seriously under this influence. Friction in relationship is a possibility today with the Moon’s square to Venus in Libra (cardinal air). Power could be the issue since later tonight (CST) the Moon conjoins Pluto.